My name is Dr. Monica Brown, and I am delighted that Dr. Armitage chose me to take care of you. Let me tell you a little about myself. I was born and raised in the midwest where, after undergrad from the University of Iowa, I earned my master’s degree as a Certified Orthoptist. This specialty in binocular vision introduced me to the wonderful world of eye care. I went on to Nova Southeastern University’s College of Optometry to become an Optometric Doctor. I have been here in Jacksonville for the past 6-and-a-half years practicing optometry at a multi-specialty group practice. I love Jacksonville and this community…it is now home. I have been married for 12 years to my amazing husband, Jarad. 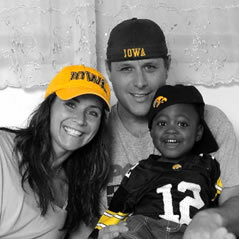 We are in the very long process of adopting our son, Mason, from Port au Prince, Haiti. We pray to bring him home by the time he turns 4 this coming April. We also have two furry babies. Herky is a Jack Russell and Chanel is a miniature toy poodle. I love to read, scrapbook, run, ride bikes, and travel. My religion and large family are very important to me. I love to help others in need. Some of my greatest trips have been mission trips to Peru and Ecuador where we provided eye exams and glasses to the poor, underserved children and people. I hope to continue such missions in the future. As you already know, the staff here at Baymeadows Vision Center is incredible. I am thrilled that such talented people have agreed to stay on so your excellent care can continue. I look forward to meeting you. It will be a privilege to serve you and give you the eye care that you deserve.